Venom is any of a variety of toxins used by certain types of animals. Venom and toxins derived from fishes, amphibians and reptiles have always held an intense interest to biologists. This book examines the past and current literature on this topic and also presents ideas for further exploration and research in this fascinating area of toxinology. Furthermore, bee venom is used in traditional medicine to treat a variety of diseases. In recent years, it has been reported that the venom, and especially one of its major constituent's melittin, possess anticancer properties. This book explores the cytotoxicity of whole bee venom, as well as melittin towards different types of tumour cells. 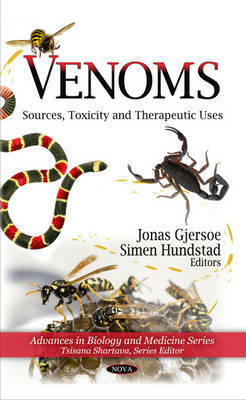 Other chapters in this book examine the different methods of collecting scorpion venom, which is known to be a rich source of neurotoxic proteins and peptides that specifically target different ion channels. An analysis of the specific immunonotherapy with hymenoptera venom, that has proven to be an effective treatment against certain allergic reactions, is examined as well. The composition and possible functions of the venom of the social vespids, belonging to three subfamilies Vespinae, Polistinae and Stenogastrinae, are also analysed and discussed.